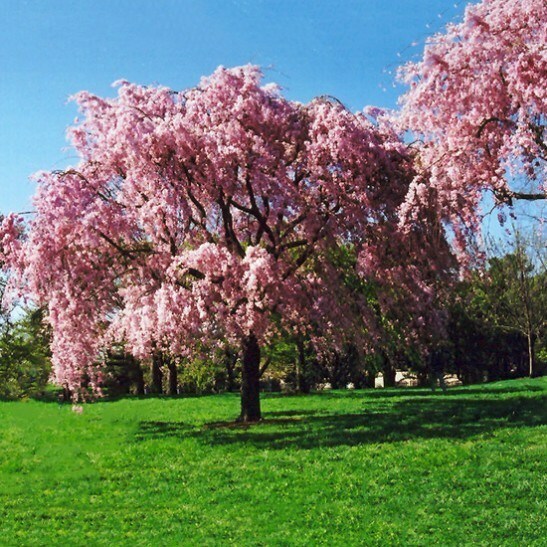 The Pink Weeping Cherry is a medium-sized deciduous tree, growing to 20 or 30 feet tall and 15 to 20 feet across, that is distinct and beautiful because of the hanging branches which reach down to the ground. In spring these are covered in beautiful pink flowers that cluster all along the bare branches. In fall the leaves turn a gorgeous golden yellow. 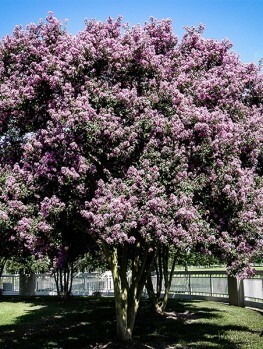 This tree is hardy in zones 5 to 8, so it can be grown in many parts of America. It grows well in a wide variety of soils and needs no special care to bloom and grow year after year. The Pink Weeping Cherry will bring beauty to any garden, from the smallest to the largest, with it cascading branches bearing soft-pink flowers right to their tips. As it grows, it continues to send out weeping branches which cascade to the ground. 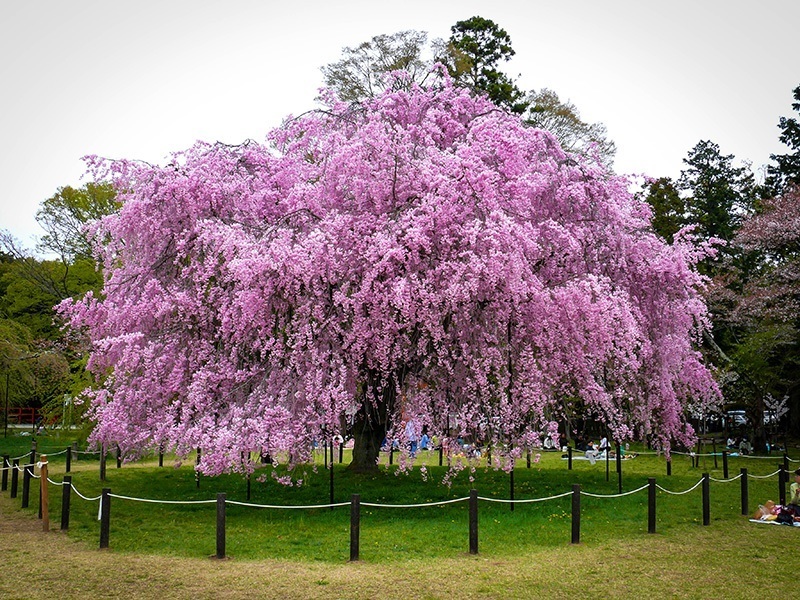 This beautiful tree will lighten up the garden in early spring, it flowers so early that the leaves only come out after the flowers have fallen. This plant is especially attractive placed at the top of a bank where the branches can freely cascade down to the ground. It also looks very beautiful planted by a pond where the flowers will reflect in the water. The Pink Weeping Cherry will grow between one and two feet a year, quickly maturing into a gorgeous specimen for your front lawn or gracing your garden as a back-drop to flowers and shrubs. 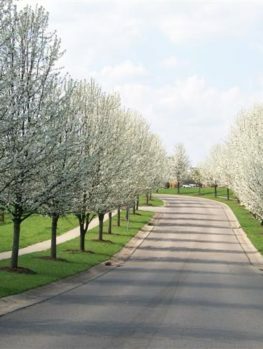 The branches will cascade to the ground if left un-pruned, or they can be trimmed each year to any length you want, so that you can, for example, walk under the tree. Despite its delicate beauty, the Pink Weeping Cherry is a tough, hardy plant that will grow happily in almost any type of soil, although it prefers not to be in acid soils. It has a few pests and diseases, but with a very little care it will reward you by growing happily for many years. It will very rarely if ever be eaten by deer. 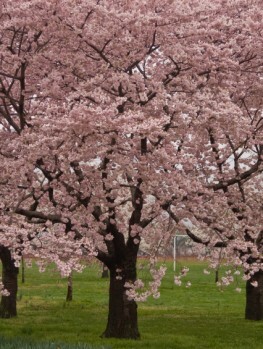 So wherever you live you can enjoy the spring beauty of this tree. Over time your Pink Weeping Cherry will develop a sturdy trunk and a large crown of pendulous branches. Every spring those bare branches will be covered in gorgeous soft-pink flowers. As the flowers fade green leaves will burst out and cover the branches for the summer, making a green column. In fall they will turn golden yellow before falling and revealing the elegant hanging branches and the glossy, dark-brown trunk. Pink Weeping Cherry is a reliable flowerer, performing well every spring, unlike some flowering trees that flower well only every second or third year. It will reach 20 to 30 feet in time, and up to 20 feet across. 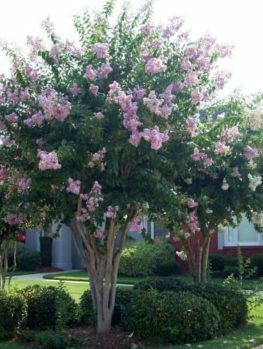 The Pink Weeping Cherry is hardy in zones 5 to 8, so if you live anywhere but Southern Texas, Florida, California or most north-central states, you can have this beauty in your garden. 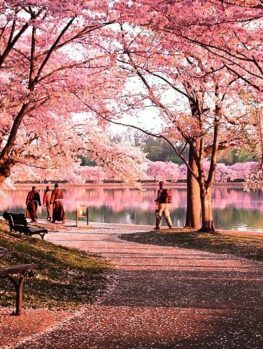 Flowering Cherry trees will grow in almost any soil, but they do best in soils that have some clay in them and are not acidic. They have a strong root-system able to find food, so they rarely if ever need fertilizer. When established they will tolerate some drought, but should be given water during extended dry periods. Your Pink Weeping Cherry will do best without competition from grass, so keep a wide tree-circle under your tree and cover it with mulch. 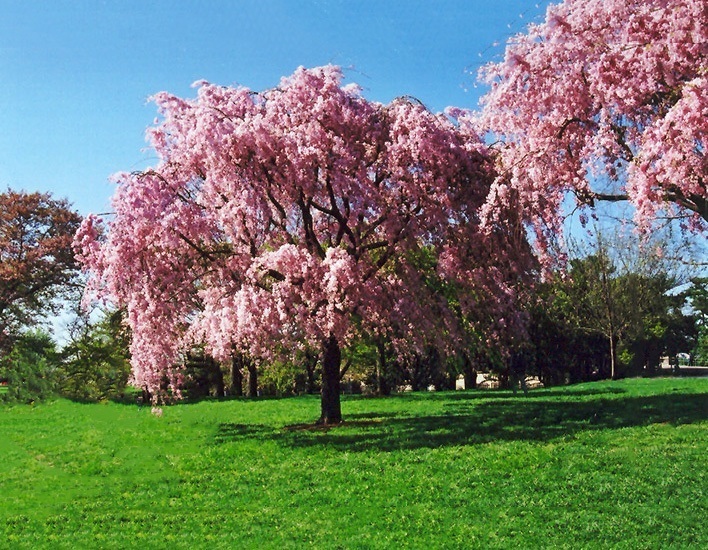 The Pink Weeping Cherry prefers an open sunny position, but it will also be happy with a few hours of the day in shade. The Pink Weeping Cherry is easy to plant. Dig a hole two or three times wider than the pot. Place your plant in the hole, replace most of the soil and firm it well down. Then water thoroughly and replace the rest of the soil. If your spot is very exposed to strong winds it could be a good idea to put in a stake and tie the trunk to it. After a couple of years take out the stake as you tree will now be ready to stand alone. Water once a week during the first growing season, but after that you only need to water when the soil has become dry. 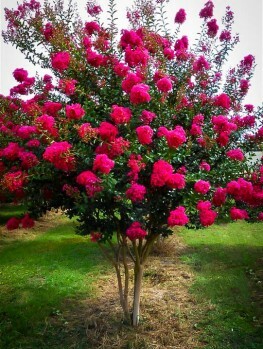 This tree needs little or no pruning, but you can shorten back the branches if they grow too close to the ground. This should be done immediately after flowering has finished. Always cut where a bud is pointing out, as this will preserve the beautiful arching form of the branches as they cascade down. Watch for any shoots that point straight up, as these are from the supporting trunk, not the Pink Weeping Cherry and they should be cut completely off as soon as they are seen. Weeping Cherries have been grown for hundreds of years in Japan and they form an important part of the famous Cherry Blossom Festivals held each spring. 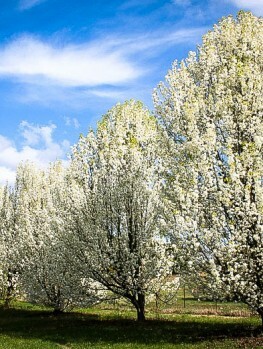 The Higan Cherry (Prunus subhirtella) grows wild across the hills and very rarely a plant occurs that has branches that fall instead of growing upright. This plant is the Pink Weeping Cherry. It was first brought to Europe in 1862 by the famous traveler and plant collector Philipp Franz von Siebold. It quickly became popular and was brought to America where it has proved to be a reliable favourite with many gardeners. Pink Weeping Cherry is a special plant and only this exact plant will have these beautiful flowers and pendulous branches. So it must be produced directly from trees absolutely known to be the correct plant. Our trees are grown the correct way, by skillfully attaching pieces of the Pink Weeping Cherry onto a strong stem. This way every tree is identical to the original. However these obviously take longer to produce, so avoid cheaper, seedling trees that will only be a disappointment.